The Sioux Falls station is located on the grounds of the EROS Data Center, outside Sioux Falls, South Dakota. SURFRAD data from the Sioux Falls site. 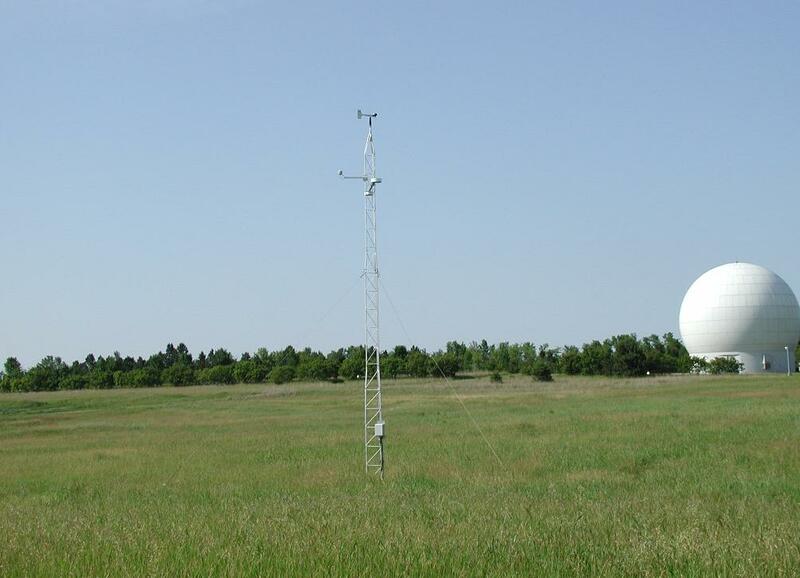 The tower, radiometer platform and solar tracker at Sioux Falls SURFRAD station, June, 2003. The EROS LandSat receiving antenna dome is visible in the background. The main platform of the SurfRad station (left) includes, from left to right, a Multi-Filter Rotating Shadowband Radiometer (MFRSR), a photosynthetically active radiometer (PAR), a UV-B radiometer, and a pyranometer measuring global downwelling irradiance. 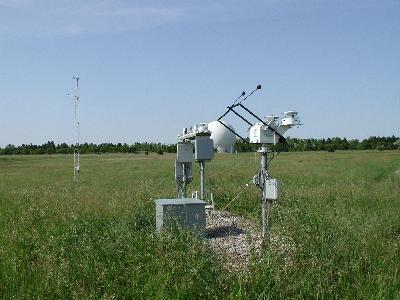 The solar tracker (right) holds a Normal Incidence Pyrheliometer (left side, pointing at the sun), a pyrgeometer (left top), and a pyranometer(right top). 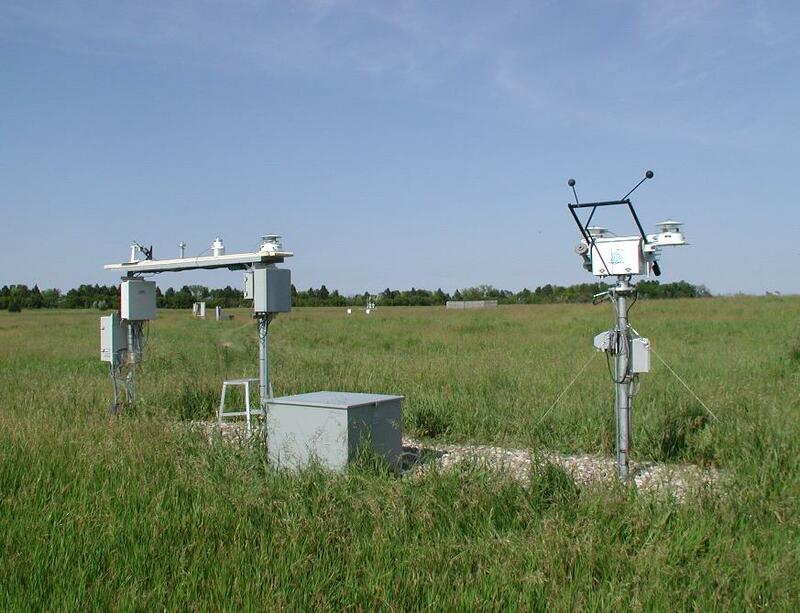 Both instruments on top of the tracker are shaded from direct sunlight by the shading mechanism of the tracker. 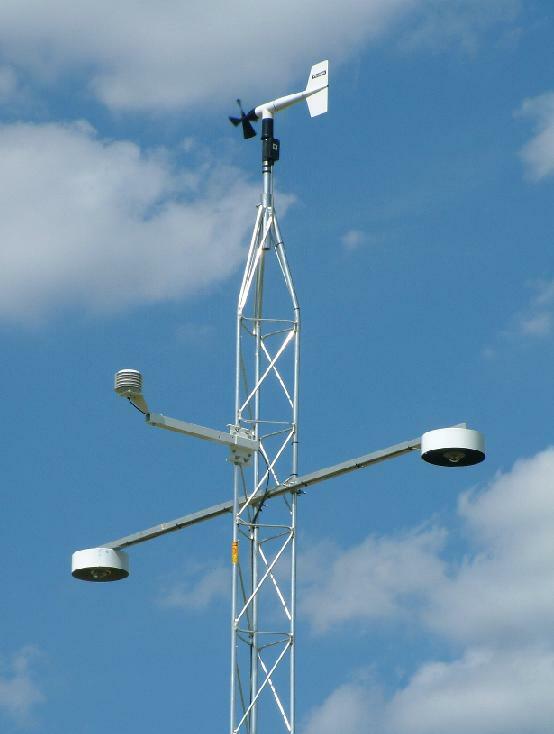 The instruments on the 10-meter tower include, clockwise from far left, a pyrgeometer measuring upwelling IR, an air temperature and relative humidity sensor, a wind speed and direction monitor, and a pyranometer measuring upwelling visible irradiance. The 10-meter tower, with the EROS LandSat antenna dome in the background.